The woman had undergone hernia surgery in November last year. Reports say 33-year-old Maheshwari Chowdary underwent surgery on November 2, 2018, at NIMS and was discharged about ten days later. Her mother-in-law told a daily that while she did not face any discomfort for more than three months, Maheshwari developed pain in abdomen on Saturday. NIMS Director Dr K Manohar said that an x-ray examination revealed artery forceps in the abdomen. “Surgical gastroenterology department was alerted,” he said. 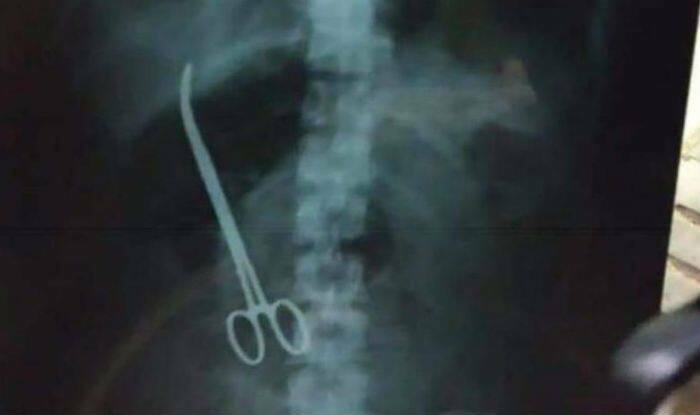 He said the artery forceps were removed by surgery. “She is stable now,” he added. A committee of the dean, medical superintendent, and surgical gastroenterologist was formed to inquire into the issue. A similar case of medical negligence led to the death of a woman whose relatives alleged that doctors left a pair of scissors in her abdomen during a caesarean operation at a private hospital in Allahabad. Around the same time as the Hyderabad woman, Priya Soni was admitted to the Mother and Child Hospital in Soraon for the delivery of her child. On October 29, she delivered a baby after a caesarean operation and was discharged soon after. But she continued to complain of severe pain in her abdomen. “An ultrasound test…showed a pair of scissors in her abdomen,” alleged her mother. “Even after 45 days of treatment, her condition failed to improve and she died,” said her mother. She lodged an FIR against the owners of both Mother and Child Hospital and Dwivedi Hospital.